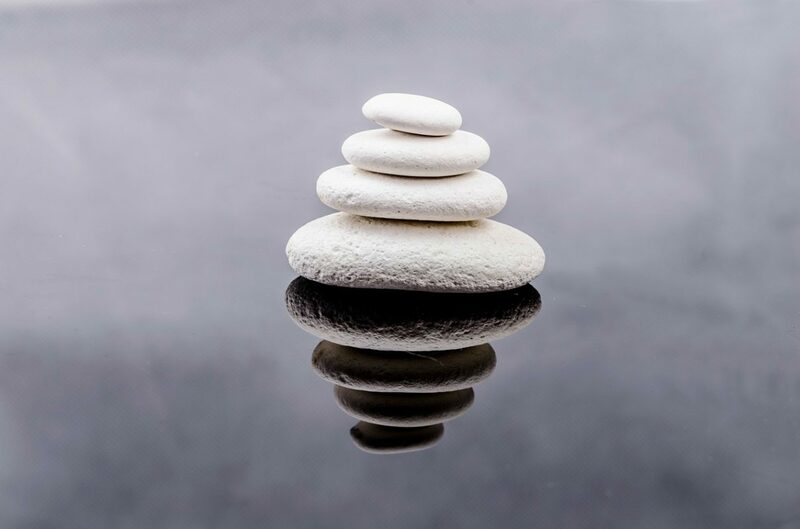 This article explains why many traders benefit from using Renko charts. It also explains how you calculate them and get a free Renko Excel spreadsheet. Modern financial markets are highly efficent and they move fast. Trade times are often measured in microseconds. We switch on financial TV and are bombarded with the latest news and opinions. Presidential tweets, central banker hints and fat fingers shift the markets back and forth. We need to pay attention or get left behind. These days every trader spends their days looking at screens. We all want the latest and best analysis tools. One of the ways we try to make our trading easier is with technical indicators. But this often leads to charts covered in indicator lines. Often giving us conflicting information about the trend, momentum, and volume. Despite our crowded charts, it is tempting to keep adding more indicators to help us understand the markets better. 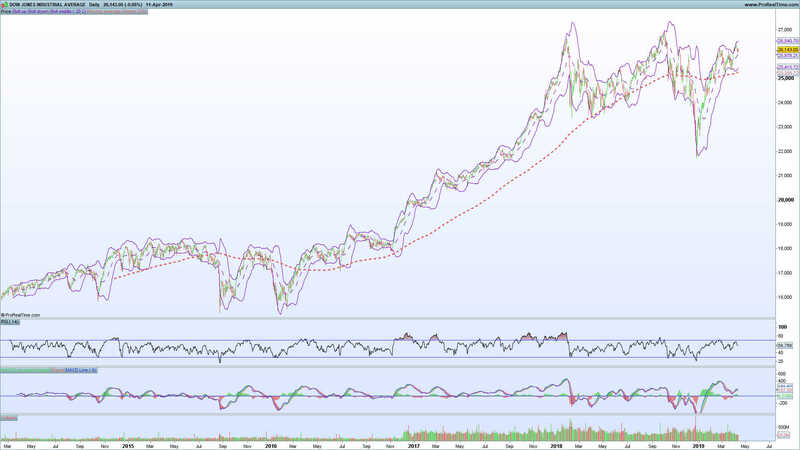 The Dow Jones chart above gives a pretty typical traders chart. Too much information on our trading charts causes cognitive overload. Our brains cannot process it all at once. So they take a shortcut – often making a snap decision based on emotion. Impulsive traders end up ignoring their strategy and jump to a quick decision. Unfortunately, this usually turns out to be the wrong choice, causing us to sell at the lows and buy the highs. Indecisive traders get paralysed by indecision. We sit there, while the market runs away from us, missing the trading opportunity. The solution to this is not to make our brains think quicker it is to give our brains less work to do. To do this we need to get to the essence of what we need to know. This is harder than it seems. Every writer will tell you, it is easier to explain something with 500 words than it is with 100 words. The only way we can simplify is to cut away what we don’t need. Renko charts are an elegant solution to the problem of overcrowded trading screens. 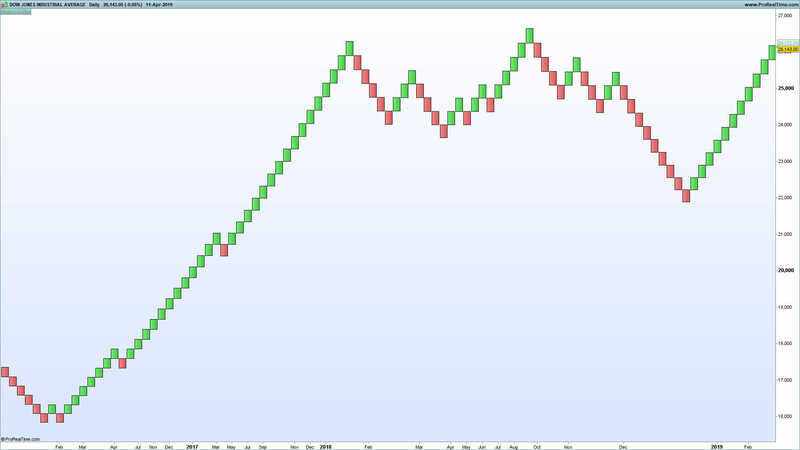 The Renko chart above shows the same time period as the previous chart but with much less mess. 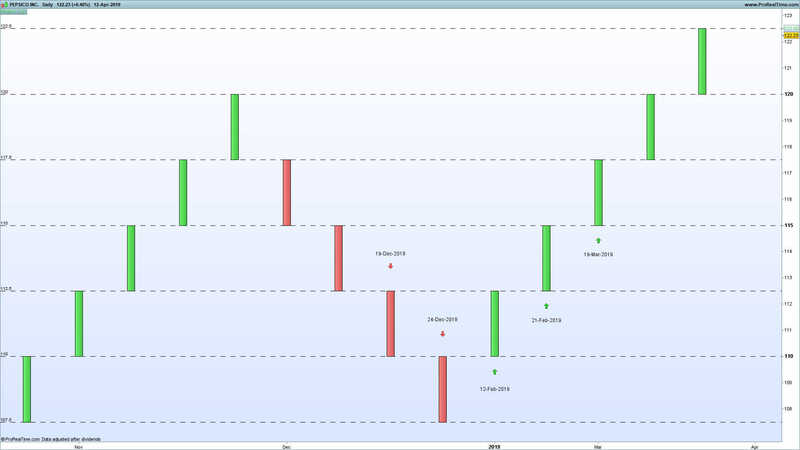 Unlike the candlesticks and bars we are used to, Renko is based on price. This means that a new bar is created only when the price moves by a certain amount. This makes logical sense. Unless we are trading volatility, we normally make money based on how much the price changes. The other interesting thing about Renko is that it has a built-in preference for trends. Once a trend is in motion, it takes a larger move to get the price to change. This is why we often see so many impressive trends on our Renko charts. The key thing to remember for Renko is that it wants to add another bar in the same direction. So a green bar prefers to be followed by another green bar and a red bar wants to be followed by another red. Renko can be applied to any timeframe. But it only uses the closing price. Intraday moves are ignored. This helps to keep us away from the market noise. Each Renko bar is a uniform size. This will vary depending on the market and timeframe. The bar size is normally either a percentage or a fixed amount. The target price is the price that the market needs to close beyond before a new bar is created. For example: in an upward trend, with a bar size of 5, the current green bar is between 100-105. This means that the market has closed above 105 but below 110. The target price to create a new green bar is 110. If the market closes above 110, a new green bar is drawn. However, if the market changes direction, the target price to start a new downward trend is 95. If the market closes below 95 a new red bar is drawn. In this example I have set each bar $2.50 high. Starting with the red bar on 19 December 2018. There was an existing downtrend. On 19 December 2018 Pepsi closed lower than 110 and a new red bar was created. On 24th December Pepsi closed lower than 107.5, and another new red bar was created. 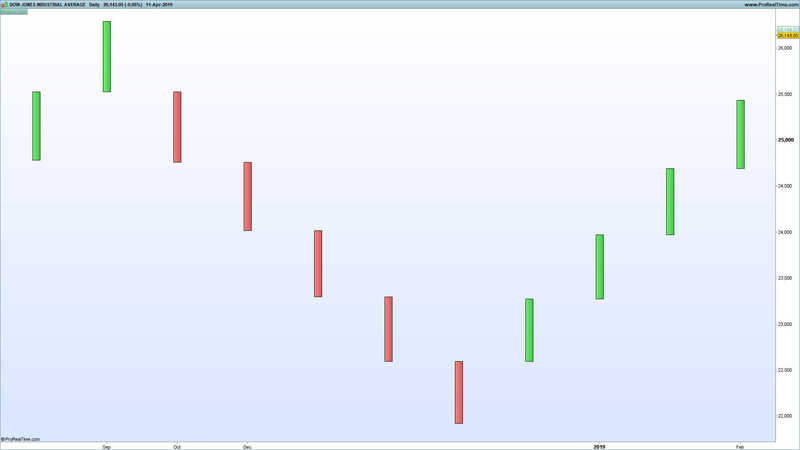 Sometime after the 24th December, Pepsi started to move upwards. On 12 February 2019 Pepsi closed back above 112.50 and a new green bar was created. Notice that the green bar is drawn from the top of the red bar. Renko is now showing an uptrend. 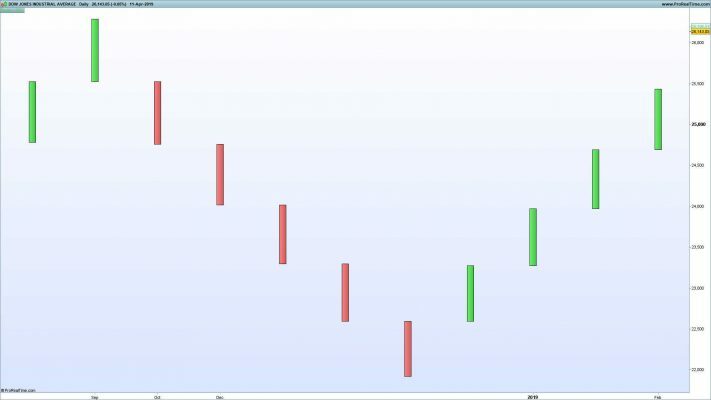 On 21 February the market closed above 115, and another new green bar was created. 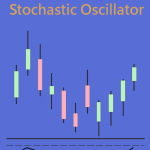 It is useful to understand how to create Renko charts. However, nobody needs to calculate them manually. You can use the power of Excel to analyse Renko on different markets and timeframes. I’ve created a spreadsheet to make it easy for you to use Renko in Excel. You can get this spreadsheet for free when you sign up to the Tradinformed newsletter. When you have signed up you will receive a link to get the Renko spreadsheet plus other great trading resources. My spreadsheet uses Excel formulas, not VBA. This means that you can see all the formulas and data. This entry was posted in Candlestick Trading, Excel Trading, Technical Indicators, Uncategorized and tagged Renko Charts.